» Forum » All Pinball » All modding! 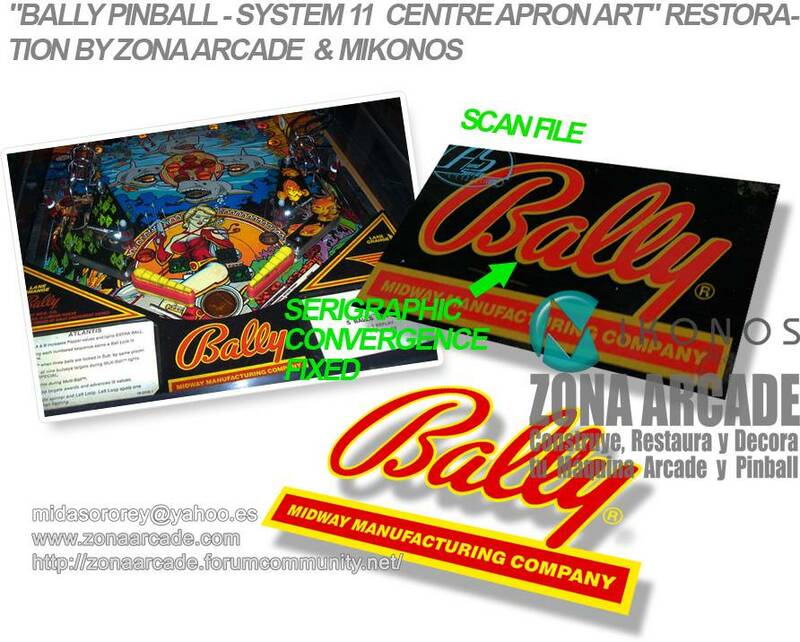 » Generic "BALLY PINBALL - SYSTEM 11 ALL APRON ARTS" FINISHED and printed!!! » Generic "BALLY PINBALL - SYSTEM 11 ALL APRON ARTS" FINISHED and printed!!! 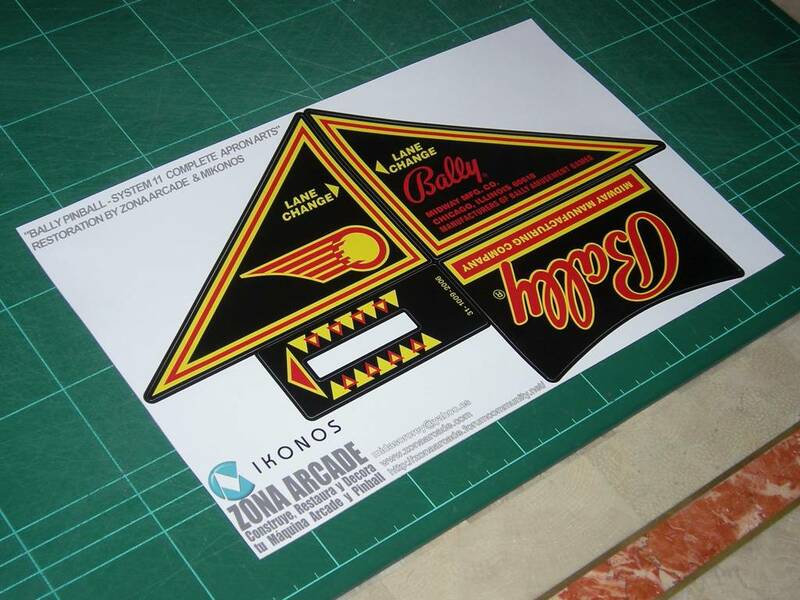 Generic "BALLY PINBALL - SYSTEM 11 ALL APRON ARTS" FINISHED and printed!!! Introduction: I´m Mikonos and I´m 19 year old in arcade and pinball hobby. I´m the webmaster of a fansite called "Zona Arcade. Construye, Restaura y Decora tu Máquina Arcade y Pinball" (14 years old) too. I have always had same nickname. I´m a fan and a huge collector of arcade and pinball cabinets, and other items related. Some year ago I realized that I like so much to restore and customized artwork, it is my main entertainment. I think I´m good at working with design programs. You can check my skills in this pinside thread in which I´m compiling my artworks about pinballs. I´m not a shop and I´m not working in a printshop! Sorry for it! I´m only a fan. I learned all about design and print materials by myself, I´m always looking for volunteers for testing of my new mods and ideas, I look for new restoration challenges and more. 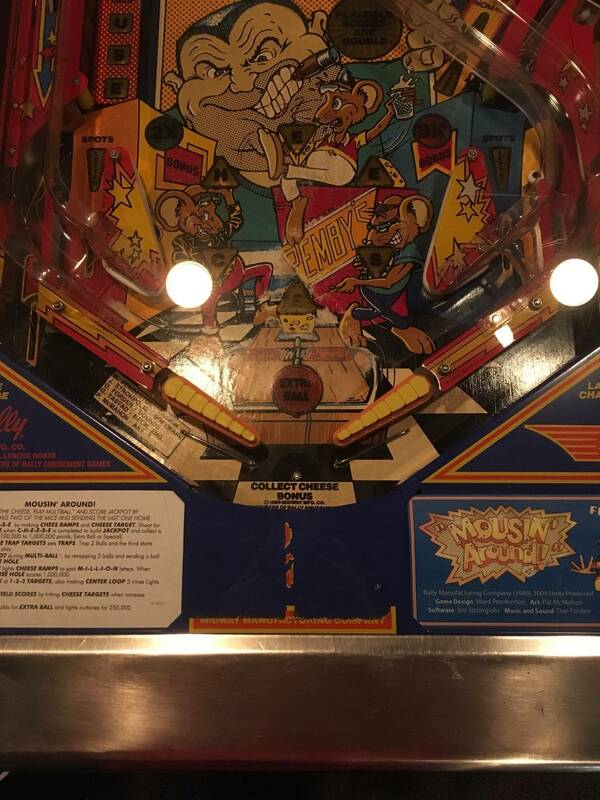 If you have a good idea about a mod for your pinball, tell me and I will try to make it a reality. I work designing and restoring for free because it is fun for me! 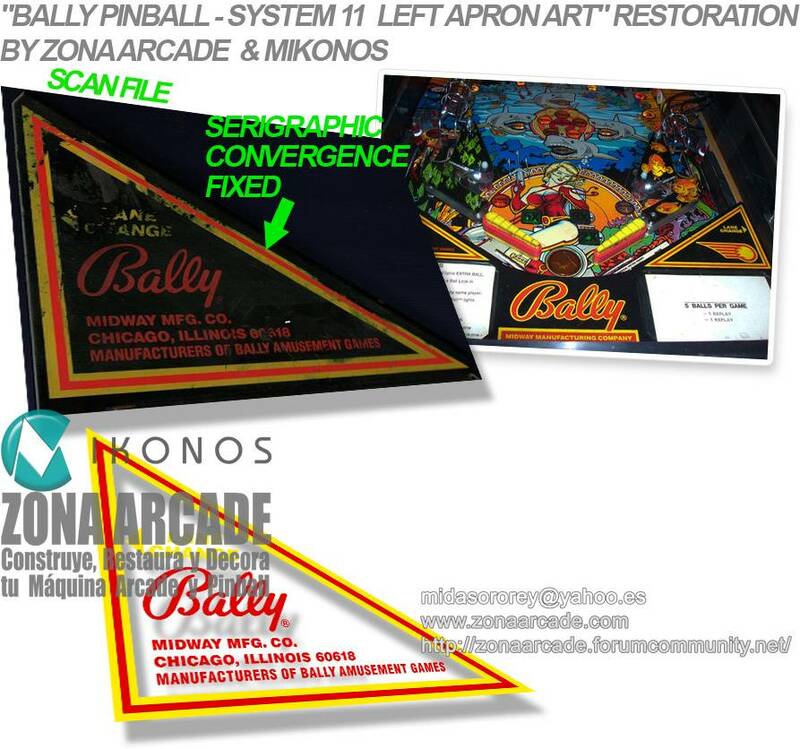 "System 11 Pinball Apron Arts" (BALLY)" are 4 serigraphic printings over metallic piece. You can find this kind of artworks in pinballs like: Atlantis, Transporter, Mousin´Around, for example. "Centre Apron Art System 11" (BALLY). Restored Zona Arcade & Mikonos. Opinions and improvement suggestions about restoration process are welcome! Mikonos last edited this post 8 days ago. My Mousin' Around apron would be a good candidate. I think you only need a central apron. 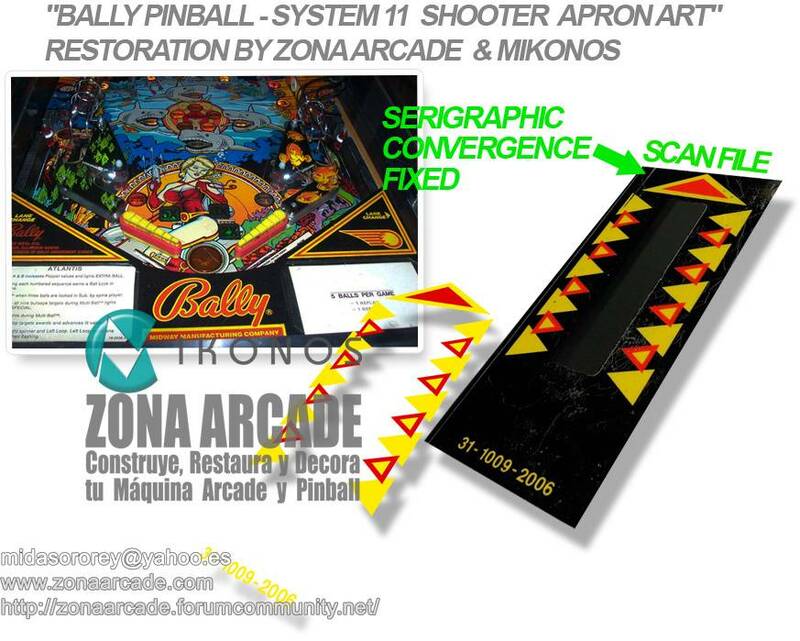 I will prepare 3 techniques of restoration for you, more or less accuracy with System 11 pinball´s original serigraphy (original print mode). I will develop them along of the next weeks and I will show tutorials about 2 of 3 techniques. 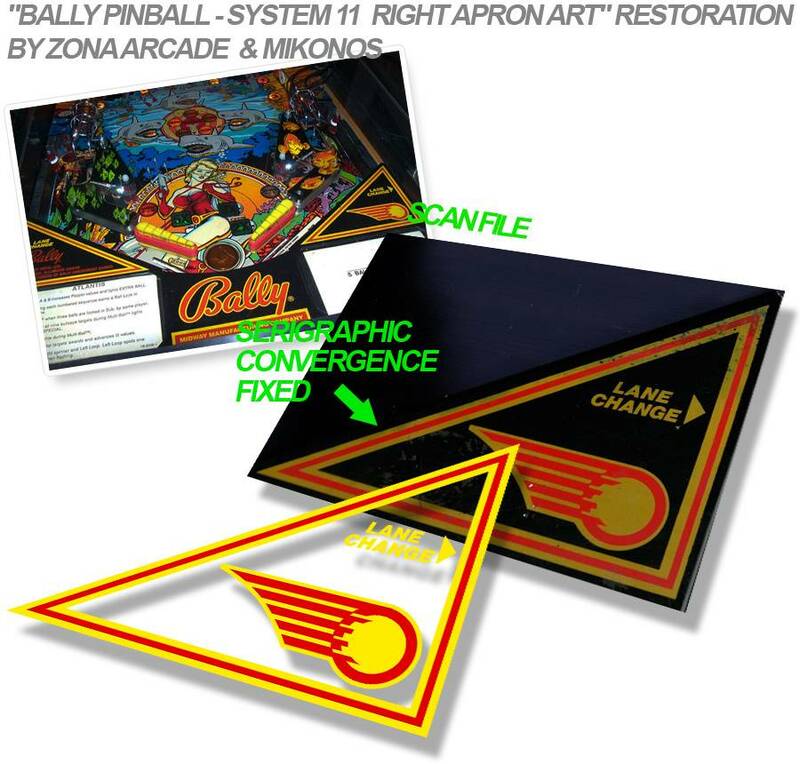 You will see them apply for first time to these kind of artworks in pinball hobby. "Left Apron Art System 11" (BALLY). Restored Zona Arcade & Mikonos. "Right Apron Art System 11" (BALLY). Restored Zona Arcade & Mikonos. "Shooter Apron Art System 11" (BALLY). Restored Zona Arcade & Mikonos. 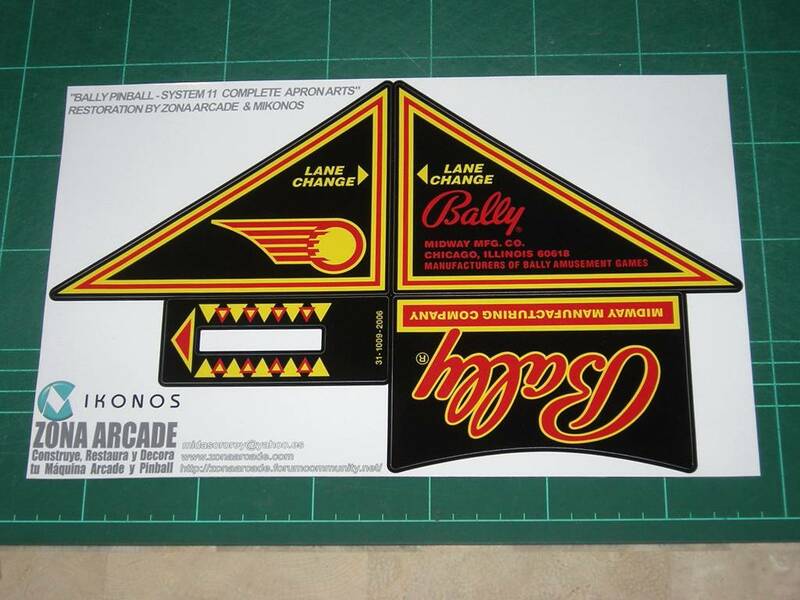 "Bally System11 Pinball Aprons" Method1: Printed vinyl and precut. Far from original serigraphy!!! Method 2 is a very faithful method, because there are not black background. 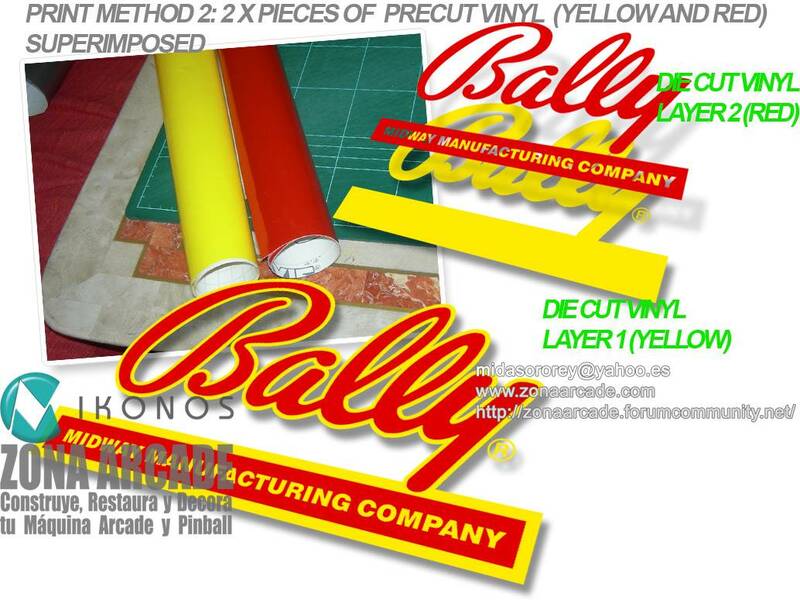 "Bally System11 Pinball Aprons" Method2: 2x Pieces of Die Cut vinyl (yellow and red) sticked over. Method 3 is the best accuracy reproduction method, it is like original serigraphy. Superposition of both stencils gets more precision that original even. 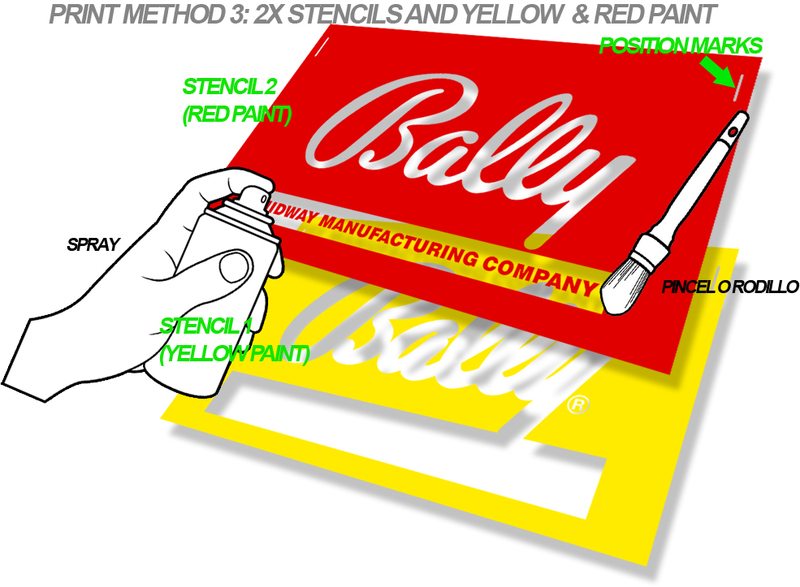 "Bally System11 Pinball Aprons" Method3: 3: 2x stencils and yellow & red paint. 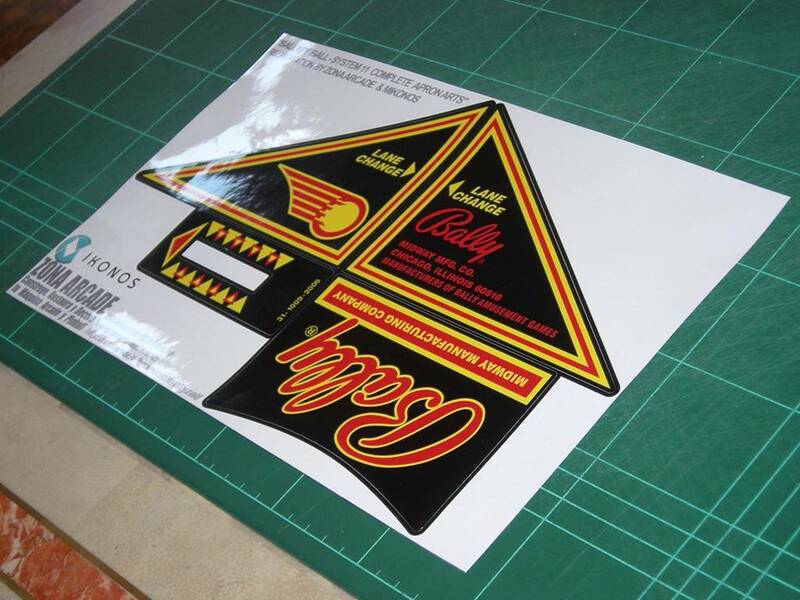 "Bally Aprons Arts" reproduction printed in vinyl with gloss protective lamination and precut (photo 1). "Bally Aprons Arts" reproduction printed in vinyl with gloss protective lamination and precut (photo 2). 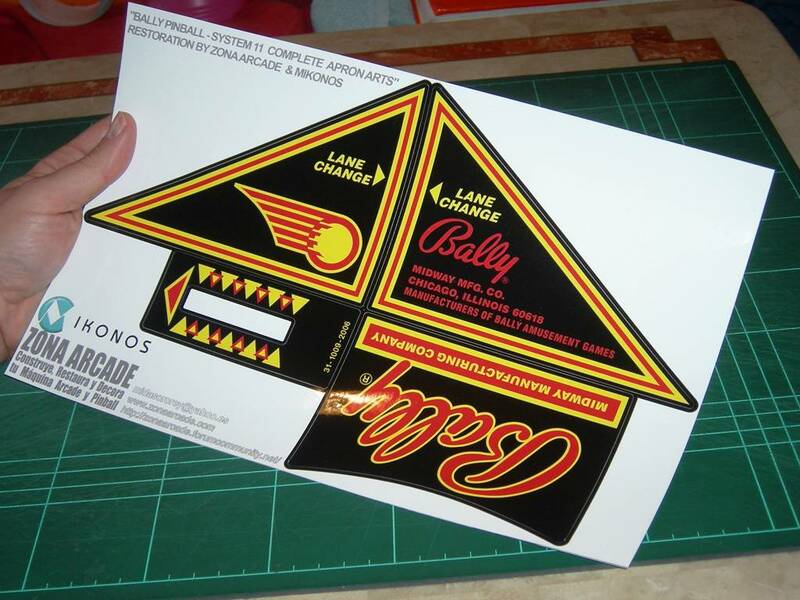 "Bally Aprons Arts" reproduction printed in vinyl with gloss protective lamination and precut (photo 3). 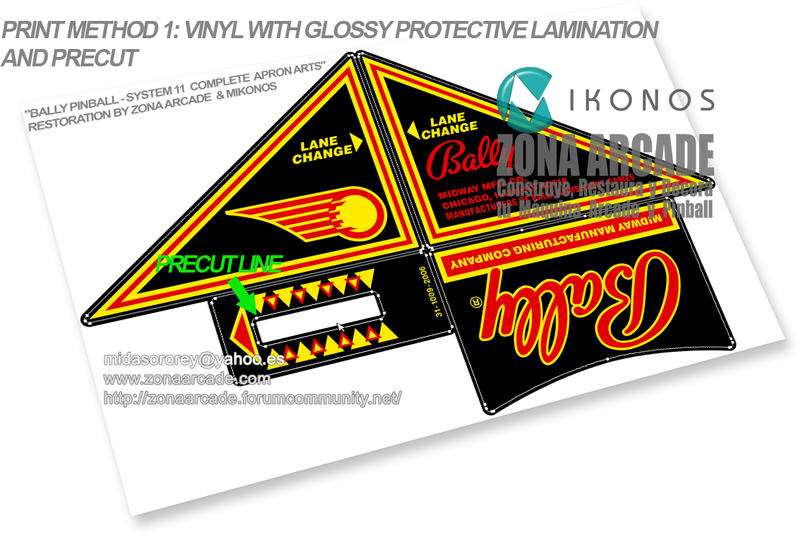 "Bally Aprons Arts" reproduction printed in vinyl with gloss protective lamination and precut (photo 4). Like you can see, precut line is perfect and centred! The most accuracy artwork in hobby!